Learn to make a creative ceramic object and participate in the spectacular annual pit-firing weekend “Terre Brûlée”. Please sign up to participate !! At Helen Green Ceramix' annual event, Grand Pique-nique de la Terre Brûlée, we pit-fire ceramic objects over two days, in Biranques (Hérault, France). 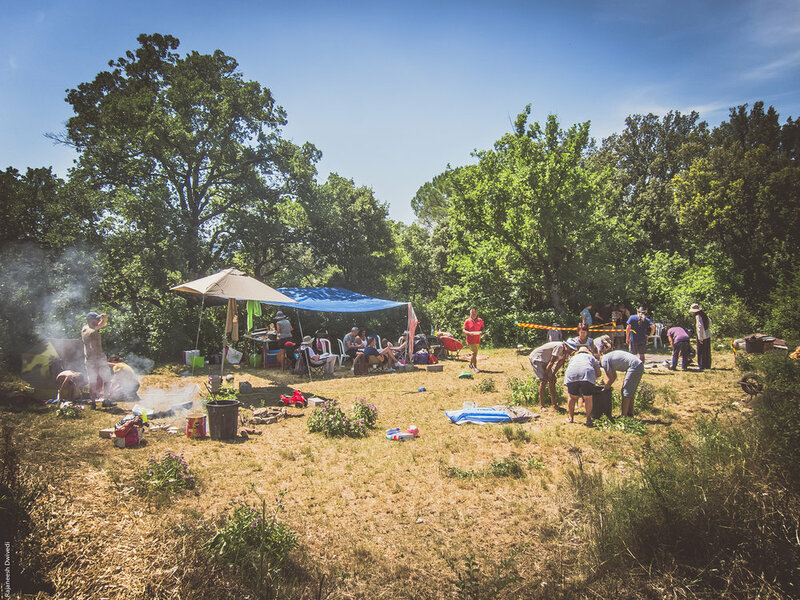 You can simply attend the spectacular weekend firing or make pieces to fire at the workshop in Montpellier ahead of the event. Learn to make a creative ceramic object for a pit-firing. Saturday 18th May 3-7pm : Workshop preparing pieces for the firing ; 7pm loading the pit, pot-luck picnic and a complementary firing beverage until sunset! Sunday 19th May 11am-3pm : Unloading ceramic artwork from the pit followed by a pot-luck picnic. Many thanks to all the brave people who took a chance on the stormy weather and joined us for a lucky and successful pit firing this year! Zero breakage in the pit thanks to our fire-master! Pots were exposed to over 820°C in the wood firing sprinkled with copper carbonate and sodium chloride, banana peels and dried pomegranates. Photos of this year's event coming soon. See some images of my pieces, painted with fire, by clicking here! Many many thanks to all those who participated in this year's very successful pit firing, in high spirits and great company. Lots of great work by all the participants and zero breakage in the pit! Pots, sculptures, plates and pit-fire-protectors, were all exposed to over 820°C in the wood firing sprinkled with copper carbonate and sodium chloride, overnight beneath a star filled sky and bright red moon. See a vidéo of the event by Rémi Vionnet on Helen Green Ceramix Facebook page. Many many thanks to all those who participated in our experimental 'greenware' (not bisque fired) pit firing, in high spirits and great company. Pots, pendants and pit-fire-protector sculptures, were all exposed to 950°C according to the pyrometric cone, in the wood firing sprinkled with copper carbonate and sodium chloride, overnight beneath a star filled sky.